Snowden International players celebrate their 9-4 win over South Boston for the Boston City League baseball championship. Under the lights at Monan Park on the campus of BC High, the Snowden International baseball team snapped off three runs all with two outs in the top of the fourth inning on Friday night to defeat South Boston, 9-4, and be crowned Boston City League champions. “To be honest this is something that we had [thought possible] in the beginning of the year,” said Snowden coach Christian Ortiz. 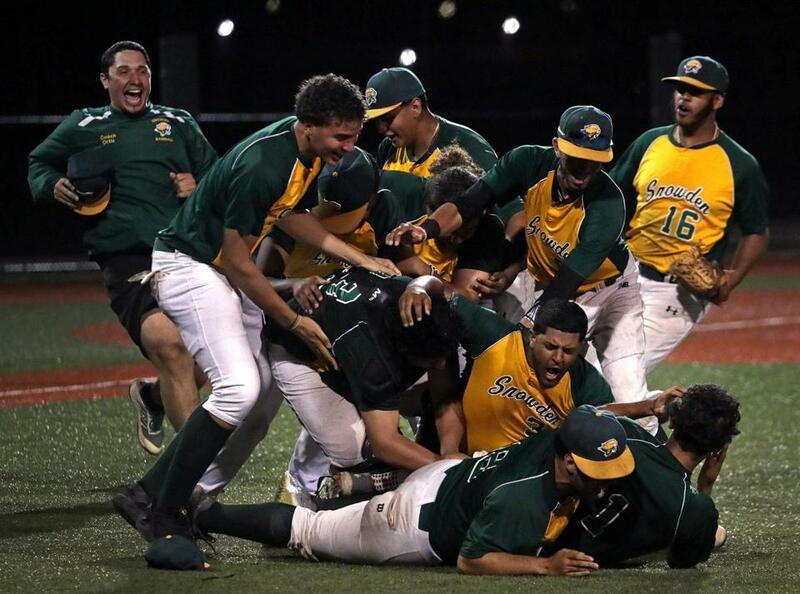 The story of the game, though, belonged to Snowden’s Luis Espaillat. The team had given up two runs on a Manny Arias double in the first inning, when the freshman came on to pitch with nobody out and the bases loaded. The righthander immediately got the Cougars out of the jam without further damage — pitching six innings in relief while also knocking three hits with an RBI, and scoring three runs. Justin Chevere came on to close the game out in the seventh. “I was just staying focused, and with all that noise that was going through my mind, I just blocked it out,” said Espaillat. Trailing, 4-2, entering the third inning, Snowden (17-4) began to work the Knights’ starter Carlos Vasquez. The righthander walked in two runs with the bases loaded before getting Joel Lara to strike out to end the threat. With two outs the following inning, the Cougars continued to put pressure on South Boston (11-6) to make plays. An errant throw to third base from the catcher Alex Troncoso on a passed ball brought Kaylm Espaillat home. Cristian Brea followed that with a single before another error scored the third run. RBI singles from Justin Chevere and Espaillat got Snowden out in front 2-0 in the top of the first inning. Brea added to his 2-for-3 day at the plate with an RBI double in the sixth to make it 8-4. Snowden went on to score once more in the inning on an error by the first baseman. South Boston senior Alex Troncoso collapsed near the dugout at the start of the bottom of the seventh inning due to heat exhaustion, but was able to be helped off the field to the paramedics. Walpole 3, Newton North 0 — Matt Chamoun pitched five shutout innings for the Rebels (15-5). Brockton 3, Dartmouth 2 — Zach Sylvia went 3 for 4 and Ian Nadeau earned the win in relief for the No. 20 Boxers (16-4). Braintree 8, Marshfield 4 — Senior Alex Kennedy went 3 for 4 and drove in three runs for the host Wamps (11-9). Wakefield 3, Reading 2 — Freshman Cal Tryder had two RBIs for the Warriors (9-10). Medford 6, Danvers 5 — The Mustangs (14-6) rallied from a 5-2 deficit in the seventh inning, pushing across the winning run on a bases-loaded walk to Jacob Whistler. Mike Nestor Jr. pitched 3⅔ innings of scoreless relief. Taunton 2, North Attleborough 0 — Senior catcher Kya Enos smacked a two-run homer in the top of the eighth inning, lifting the No. 4 Tigers (21-2) to the Hockomock League win in North Attleborough. Freshman Kelsey White pitched a complete game while striking out 12 and allowing just five hits. North Andover 12, Lawrence 3 — Deven McElhiney went 2 for 4 with three RBIs to lead the Knights (15-5, 9-5 MVC). West Bridgewater 9, Tri-County 2 — Morgan Doherty went 2 for 3 with three runs and an RBI while Morgan Bellody worked four innings of scoreless relief for the Wildcats (19-1). Case 6, Bishop Stang 4 — Ali Feilhauer went 2 for 4 with a triple and catcher Madyson Medeiros added a pair of hits for the Cardinals (15-5). Plymouth South 5, North Quincy 1 — Freshman Amelia Freitas struck out six as the 17th-ranked Panthers (18-2) clinched the Patriot League Fisher Division title. Sacred Heart 4, Holbrook 0 — Jillian Blake struck out 11 in a complete-game performance for the Saints (12-4, 8-2 Mayflower). Arlington Catholic 6, St. Mary’s 4 — Junior shortstop Lexi Morris went 2 for 4 with an RBI and freshman catcher Caroline Macri made two putouts and had an RBI for the Cougars (14-6). Cardinal Spellman 7, Fontbonne 5 — Chloe Kelly was 3 for 4 with a pair of doubles for the host Cardinals (12-8). Lincoln-Sudbury 3, Nipmuc 1 — Captain Tristan Wolf had 23 points on serve, including 12 straight in one run, as the 20th-seeeded Warriors (13-7) upset seventh-seeded Nipmuc in the first round.